The ECA has has partially revised the decision of the EHF Arbitration Tribunal. The EHF Court of Arbitration (ECA) has published its decision on the claim filed by Mr Gunnar Prokop and Hypo Niederösterreich against the decision of the EHF Arbitration Tribunal taken on 4 November 2009. The ECA rejected the decision of the EHF Arbitration Tribunal to ban Mr Gunnar Prokop from any EHF function for life. Mr Gunnar Prokop shall be suspended from all international handball competitions and from any EHF activities for a period of one year from the date of the EHF Arbitration Tribunal decision. Mr Gunnar Prokop shall pay a monetary fine of €10,000 to the EHF. The point gained by the club Hypo NÖ at the 2009/2010 Women’s Champions League group match against Metz Handball shall be deducted from the club. 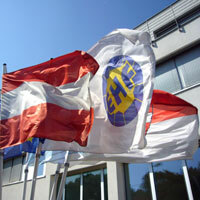 The ECA rejected the decision of the EHF Arbitration Tribunal and declared that Hypo NÖ shall not pay monetary fine. The decision of the ECA shall be final and binding for all parties involved.